Why was my favourite Nigerian juice bar knocked down? Image caption One of the owners looks on helplessly as the building she operates in is razed to the ground. A few days ago on the way to the office, I grabbed breakfast at a new juice bar on the street where I live. When I went back to get coffee three hours later, it was gone. Instead, there was a pile of rubble - as if a miniature tornado had swept along the small row of shops that had been there, gobbling each and every one of them up, before abruptly running out of steam at a huge apartment building. This strip of businesses - fronting a leafy street - was unique for Lagos. There were cafes with benches outside, a small supermarket stocking the essentials, a brand new pharmacy, a bakery and a dance studio - all of them run by women. That morning, at 09:00 Ada Osakwe, owner of Nuli Juice, got a call from her manager who told her armed police with a bulldozer were outside the cafe. The officers said the building was to be demolished immediately. When she arrived 10 minutes later, Ada found her staff trying to rip fixtures from the walls and throwing tables and chairs out of the window onto the rain-soaked street. Later, I saw videos of a bulldozer with its yellow metal claw hacking at the polished wood and glass of this brand new cafe. All the businesses were razed to the ground by the Lagos state government. The owners stood on the street staring in disbelief at what had just happened. And the reason for all this destruction? The engineer in charge told the owners that the premises had no permit - and that they had told the landlord this six months earlier. 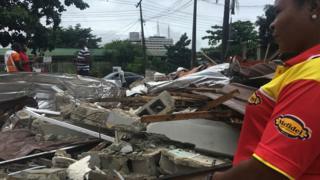 Two days after the demolition, Lagos state government issued a statement saying the buildings were "causing environmental nuisance, traffic snarls and more importantly a security threat to the neighbourhood". But I live on this road and have never noticed a problem with traffic or felt any threat. Demolitions of businesses - especially market stalls or roadside shops - happen regularly in Lagos. The government usually says these traders have no permit or permission to operate. Razing concrete buildings to the ground happens less often. But just a few days after the Lagos demolition, a bakery in the capital Abuja was threatened with demolition too, after five years in business at the same spot. When I posted a video of the Lagos demolition on Twitter, I got caught up in a social media storm of indignation. Many people were asking where the landlord was in all of this. He's currently abroad, but I tracked him down and he told me that he found out about the demolition the evening after it had happened. He seemed to me as shocked about it as the tenants. He told me the building had been marked with an X in red paint last March, so he went to see officials in the state government to find out why. He said he showed them what he had invested in the area - paving the public road and fixing the drainage. He added that the officials told him they would get back to him. And that was the last he had heard - until the demolition. But he wasn't too keen to complain. "In Nigeria, you take any beating from the government," he said. "If you make a fuss, the government will go after you." Recently, Lagos state government also closed a market that had emerged around a police barracks. The owners of those businesses are suing the state. What they intend to argue, I've been told, is that the authorities in Lagos were inconsistent. They allowed the shops on my road to stay open for much longer than the ones near the police barracks. It may be impossible to unearth what prompted the order to rip down six thriving small businesses. But if the reaction is anything to go by it was an insensitive move at a sensitive time for Nigeria. The country is now officially in recession, following the fall in the oil price. To reduce dependency on oil, the federal government says it's promoting agriculture and entrepreneurship. But that claim feels empty when a juice bar that works with local farmers is torn down, along with a vegetable shop that sells Nigerian produce. Just a few days before the demolition, I followed Mark Zuckerberg as he made a surprise visit to Lagos. The Facebook founder praised the country's entrepreneurial spirit and the great and the good of Nigeria nodded in approval. But one young tech entrepreneur who met Mr Zuckerberg told me that businesses like hers thrive, not because of their government but despite it. They battle poor infrastructure, erratic power supply, sky-rocketing inflation and government that they think throws obstacles in their path. Many Nigerian businesses are struggling. And for now any pledges to help entrepreneurs mean little to those on the street I live on, who are still picking through the rubble - to salvage what is left.